Sioux Falls, SD (April 17, 2018) — On Wednesday, April 4, Raven hosted its third annual Raven Aerostar Balloon Day. 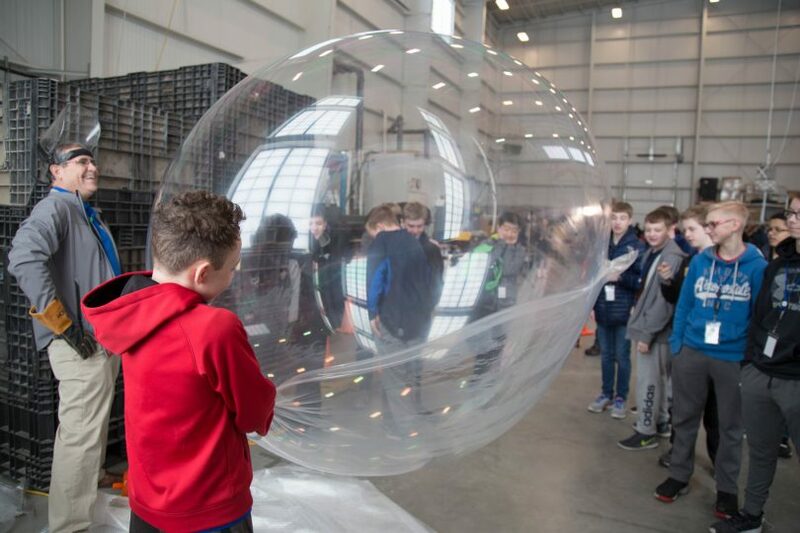 Over 200 students across six middle schools gathered at the Raven Innovation Campus and Raven Aerostar's manufacturing facility in Sioux Falls, SD to participate in the largest Balloon Day to date. Balloon Day serves the purpose of encouraging and supporting STEM (Science, Technology, Engineering, and Mathematics) education among South Dakota students while exposing them to the profession of engineering and manufacturing technologies. Throughout the course of the event, students observed a zero pressure balloon launch, witnessed a drop test in support of stratospheric platform advancement, participated in hands-on workshops regarding stratospheric balloon technology, viewed the manufacture of stratospheric balloons, and engaged with team members whose careers are rooted in STEM education. Raven Aerostar team members had a tremendous time watching the excitement and enthusiasm from the students, and we look forward to hosting Balloon Day again next year. For more information about Raven Aerostar and our stratospheric balloon technology, visit RavenAerostar.com.